Posted by Samantha Prosser on Wednesday, May 24th, 2017 at 2:33pm. 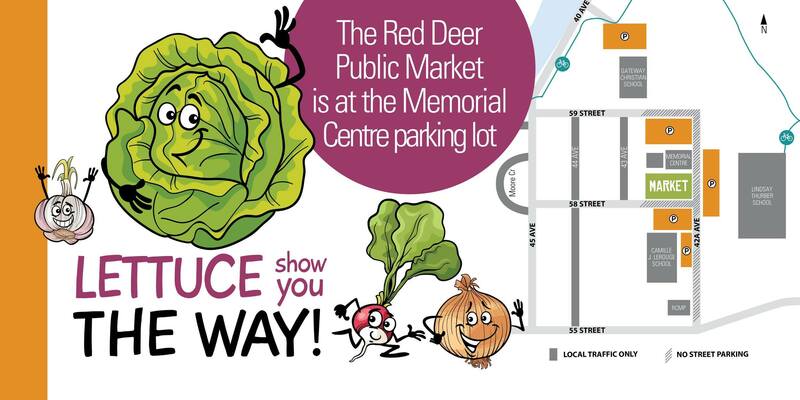 The Red Deer Public Market is opening for the season at the Memorial Centre parking lot. Lettuce show you the way! You can get to the Market by bus (take Route # 5), by walking or cycling on the connecting trail system or by driving. Cyclists; there is a bike lock-up available on site for safe storage while you shop. For drivers there is plenty of parking available at Lindsay Thurber High School, Camille J. Lerouge School and at Gateway Christian School parking lots.